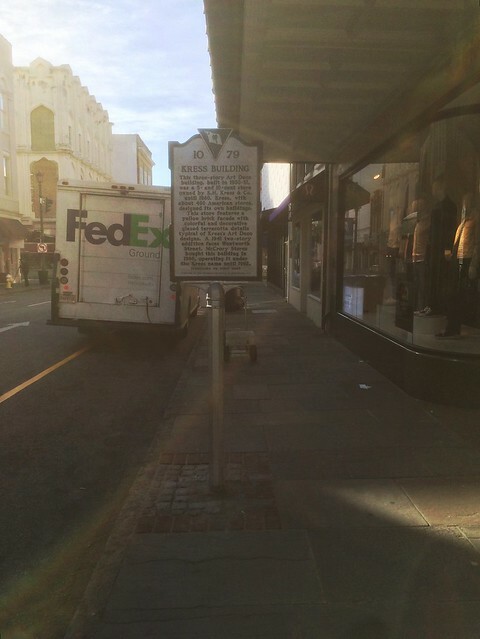 This marker is located at 281 King Street, Charleston, South Carolina. The GPS coordinates for this location are N 32° 46.968 W 079° 56.059. 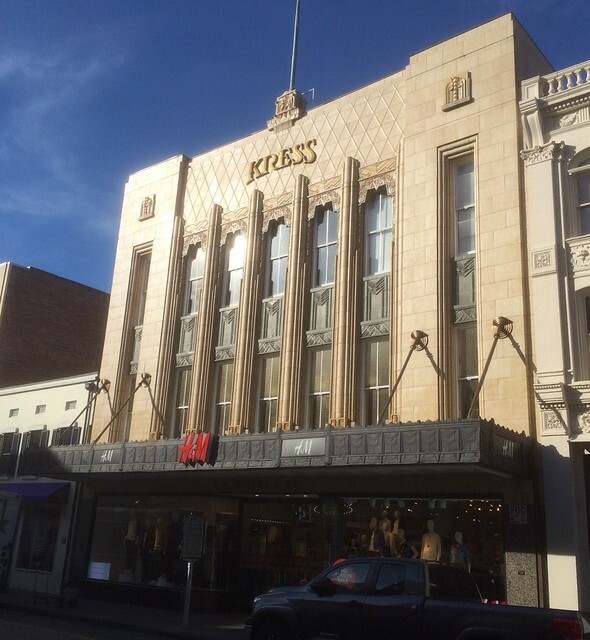 This three-story Art Deco building, built in 1930-31 was a 5- and 10-cent store owned by S.H. Kress & Co. until 1980. 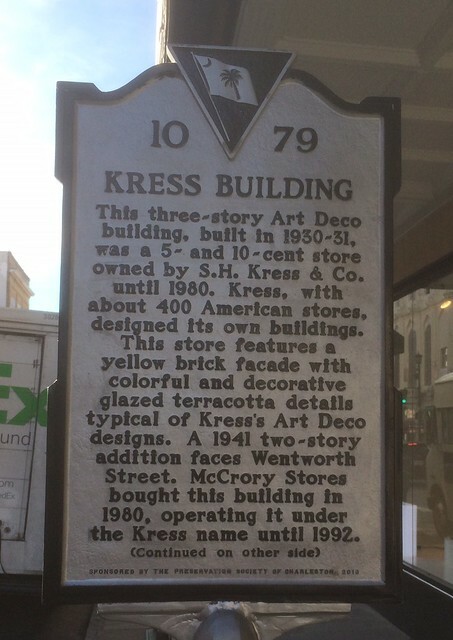 Kress, with about 400 American stores, designed its own buildings. This store features a yellow brick facade with colorful and decorative glazed terracotta details typical of Kress’s Art Deco designs. A 1941 two-story addition faces Wentworth Street. McCrory Stores bought this building in 1980, operating it under the Kress name until 1992. On April 1, 1960, the lunch counter here and those at the Woolworth’s and W.T. Grant’s stores on King St. were the targets of the city’s first civil rights “sit-in.” Black students from Burke High School were denied service but refused to leave. Arrested for trespassing, they were later convicted and fined. 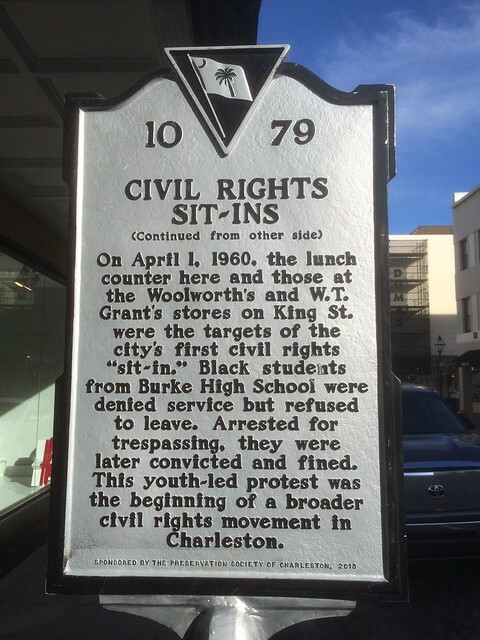 This youth-led protest was the beginning of a broader civil rights movement in Charleston.